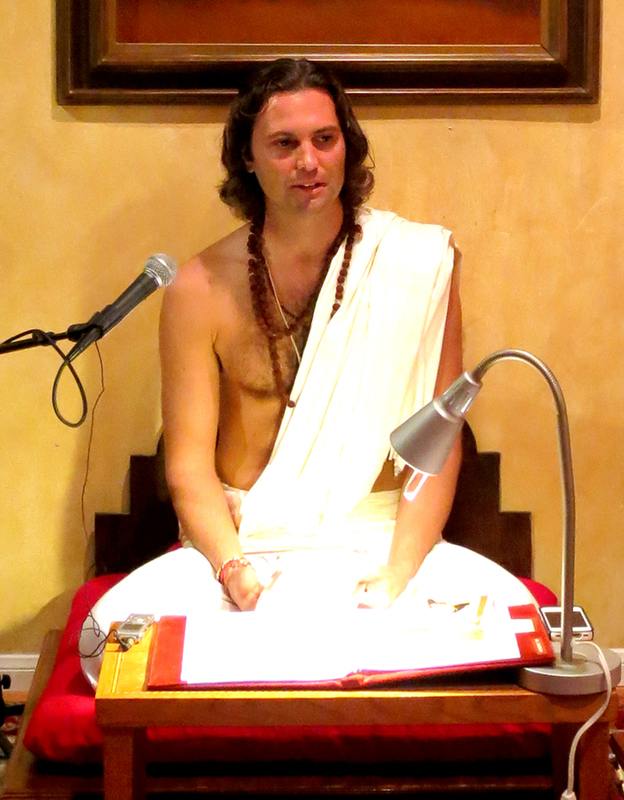 Naren K. Schreiner (Kamalakanta) gave a discourse at the Kali Mandir in Laguna Beach on Paramahansa Yogananda and his intimate and profound relationship with the Divine Mother, Goddess Kali. A recording of the entire talk, given on February 15, 2014, is below. A written transcript was published as a 3-part series in the Himalayan Heritage, a publication dedicated to Sanatana Dharma (India's ancient sacred tradition). The following article is Part I, here published courtesy of the Himalayan Heritage, with pictures added by Sangita Yoga. First published June 2014. The complete talk is available in the player below, to stream or download. If you wish, click "Download" on the player to save it to your device. But be sure to see the photos in the article! If you prefer iTunes podcast, it is available on Kali Mandir Satsang, talk #92. It is such a privilege to be here in Ma’s presence at Kali Mandir, in the presence of Usha Ma, Swami Ambikanandaji and all of you. [Swami Bhajanananda was away in India] From my elders I request permission to begin. I feel very blessed to be here. In my youth I had the great blessing to be exposed to Paramahansa Yogananda and his teachings. When I was very young, my father went to the Lake Shrine, one of Yoganandaji’s beautiful centers in Los Angeles. There are many centers including one in Encinitas. Some of you may know of them. My father became a disciple and began to meditate. So I had exposure from a young age. It is unusual for an American to have that. As I got older I heard more and more stories about Yoganandaji, saw his beautiful pictures, and read his writings. I too felt very drawn to follow his teachings and become his disciple. As time went on, I wanted to know, “Who was Yogananda?” I joined his ashram when I was 18, and had the desire to be a monk, a brahmachari, in the Self-Realization Fellowship ashram. In India SRF is known as Yogoda Satsanga Society. I realized that though I had so much access to his teachings, his pictures and so on – so many wonderful stories, I felt something was missing. I felt like a child who was being told who his father was without meeting his father in person. I read his words yet I wanted to know what was in his heart of hearts. I was searching for what made him who he is. I want to show you this picture because it had a great impact on me. It is Yoganandaji when he was 16. I was also 16 when I read his book and began practicing his sadhana. I used to look at this picture and think, “If only I could be with him when he was 16; if I could be one of his disciples at that time of his life when he was doing his sadhana.” I wanted to know more about his sadhana and how he became Yogananda before he came to America. So I became very drawn to India. I wanted to study more because I knew that if I didn't understand India I wouldn't be able to really understand who he was and who he is. Usha Ma wrote a beautiful article called The Great Sacrifice, about Swami Vivekananda, and I recently read it. It’s on her blog. One part really stood out to me. She said, “The West has historically taken concepts from the East, and to make them their own has taken them out of context. If I say yes to Vedanta and no to Indian culture, I will loose vital context. The setting for a diamond is almost as important as the diamond itself.” I had this same experience where I felt that I had the diamond yet it wasn't complete, it wasn't ‘set’. So when I read this I thought, “It’s the same with Paramahansa Yogananda, and with any great soul, especially when he comes to the West. We have to look at his background. We have to look to India." So I began to research and find out more about Yoganandaji’s more personal life, particularly in India. One thing that always stood out to me was his love for Divine Mother. That was the word that he used: Divine Mother. Just as when Swami Vivekananda came to the West, there was no concept of God as Mother. It’s not even recognized in the Judeo-Christian culture. When Yogananda would speak to Western audiences he would say, “Divine Mother”. There was one song that he wrote, “Receive me on Thy Lap” It has a very beautiful melody: “Receive me on Thy lap, O Mother. Cast me not at death’s door. Receive me on Thy lap, O Mother. Cast me not at delusion’s door.” I had never heard anything like this and I wanted to know more. Who is this Mother? In his lectures in later years, the 1940's, Paramahansaji began to talk about Ma. In one he said, “If only you could behold the beautiful eyes of the Mother that I beheld last night. My heart is filled with joy eternal. I said to Divine Mother, ‘It is You who are real, and all else is unreal,’ and Divine Mother smiled. I prayed, ‘O Mother, be Thou real unto all,’ and I wrote Her name on the foreheads of those who were present.” He was with a small group of his disciples. When I read that I visualized it and longed that I could have been there when he was conversing with Ma and he wrote Her name on their foreheads. Then the thought came to me, “What is Her name? What name did he write?” I didn't have the answer, but after that I really searched and read through his books and eventually I found what Her name is: Kali – Kali Ma. When I searched, I looked at the book called, Mejda. “Mejda” means “second oldest brother” in Bengali. It was written by his younger brother, Sananda Ghosh. I think it is one of the most important books on the personal life of Paramahansa Yogananda because it is the only record we have of what his life was before he came to America. Only his younger brother had the foresight to write this, otherwise we wouldn't know. In this book is something very beautiful about the lineage of gurus that Yoganandaji had. It throws light on how much devotion to the Mother his lineage of gurus had. The lineage begins with Mahavatar Babaji, the very mystical rishi about which not much is known. He initiated Lahiri Mahasayaji, ‘Mahasaya’ being a title. His full name was Shyama Charan Lahiri, from a Bengali brahmin family that lived in the Bengali district of Varanasi. I didn't know for many years that ‘Charan’ meant the feet of the Divine. “Shyama Charan” means “the Dark Mother’s feet.” His very own name pointed to the worship of the Divine Mother. He initiated Yogananda’s parents. Original and unaltered photograph of Sri Shyama Charan Lahiri Mahashaya. His parents heard about the great master, Lahiri Mahashaya, and traveled to Varanasi and took diksha from him. They then returned to Kolkata. That night, Yogananda’s mother had a dream. She saw a murti (a sacred statue)of Goddess Chandi Devi appear in their puja room. Their family worshiped Vishnu. They only had a shaligram in their puja room. That very night, after diskha from Lahiri Mahashaya, she had that dream and she lit a lamp – there were no electric lights yet. She went to the puja room and held up the flame. There was a big crack in the corner wall. Looking into the crack she found an 8-metal murti of Chandi Devi. She woke up her husband, Bhagabati Ghosh, and asked him to come with her. They found the murti and began worshiping Chandi as well as the shaligram of Vishnu. They hired a pujari so to worship both murtis everyday, and they are still being worshiped to this day by disciples of Yoganandaji in Chennai. In speaking with our Swami Bhajananandaji, he told me that the 8-metals composition is very traditional in the way that Chandi Devi murtis were made. As time went on, young Mukunda’s love for Ma Kali was so intense that the family began to support his devotion. When he was one-year old, his mother took him for a blessing to Lahiri Mahashaya in Varanasi. The master told her that her son would be a great soul. To encourage his spiritual inclinations, she made a Kali murti for him. She wanted to encourage his spiritual nature in every way, so she made a perfect image of Ma Kali for him about 1½ feet high. They put this murti on a low stool and performed puja together. So even at such a very young age, Mukunda performed Kali Puja everyday, even before moving to Kolkata. In 1906, the family moved to Kolkata, where Bhagabati was transferred. They moved into a house that was right across from a school. That is where he began to meet some of his boyhood friends. He was already 13 at this time, so he was now becoming more active with his friends, and all he wanted to do was to be a yogi. He told his friends to make a murti of Ma Kali. So they did, with all the materials that were used in those days, like jute, which they dyed black for Ma’s hair. One of his friend’s father owned the school and was the headmaster, so they brought it to him. They said, “Look we have made this murti of Ma Kali.” The headmaster replied, “Then we must have a Kali Puja here at this school,” – the “Deaf and Dumb School, on Garpar Road. Then a great tragedy happened in Yoganandaji’s life: his mother, Gyana Prabha Gosh, suddenly died. He was very young, and he was away from home, so he couldn't even see her. He was with his father and it was a sudden death from Asiatic cholera. At this time, as he writes, his devotion to Ma increased a thousand-fold because he realized that the only mother he had now was Kali. At that point his sadhana changed. He began to spend many hours under what in Bengali is called the sheoli tree. Little white flowers would fall and he would meditate there and just cry. No one could comfort him. How can you say anything to a young boy who has just lost his mother? Everyone let him alone to meditate, pray and cry under the sheoli tree. It took me many years, until I was in India, that I found out that the sheoli tree in the parijata, a very holy tree often mentioned in India’s scriptures. Master Mahashaya, known as Sri M.
This concludes the transcript of part I of Naren's talk. Listen to the full podcast in the player at the top of this article. Naren (Kamalakanta) giving this talk on february 15, 2014 at the kali mandir. Naren has become deeply involved at Kali Mandir in Laguna Beach, where he is known as Kamalakanta (the name given to him as part of his initiation into traditional Kali worship). Naren lives there and serves as assistant pujari. The purity and traditional nature of Kali Mandir has made it a center of rarefied spiritual vibrations. A satsang is conducted at the Mandir each Saturday evening. On February 15, 2014 Naren presented this talk on the relationship between Paramahansa Yogananda and the Divine Mother Kali.